A couple of weeks ago the Champagne Bureau hosted its annual Adelaide masterclass. Every year, the Bureau runs a series of classes throughout Australia to promote Champagne. Now, you probably think that Champagne doesn’t really need any promoting but then again, how many times have you heard someone refer to their glass of Champagne when it turns out to be anything from a bargain basement wine to a premium Australian sparkling? This is actually one of my (many) pet hates. It sets my teeth on edge. For a start, if it’s a premium Australian sparkling, we don’t need to gussy it up and call it “Champagne” – it’s good enough to stand on its own, for exactly what it is. And if it’s a cheapie (and the cheapest I could find on a well known national retailer’s website was around $4 a bottle) then it’s nothing short of devaluing the Champagne brand. 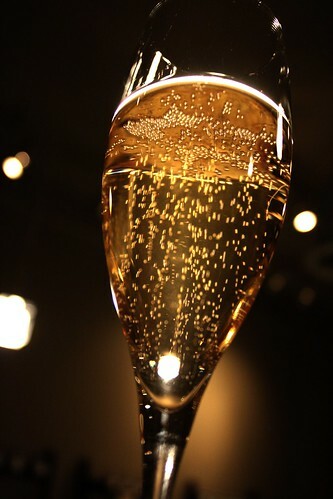 Champagne is sparkling wine that comes from a very particular area of France. And it’s not just a very particular area – it’s a very particular set of vineyards in that area. And the wine has to be made in a very particular way. I’m not going to go into the details – for many people that would be boring, verging on tedious. Just trust me – if it doesn’t say Champagne on the bottle, it’s not Champagne. The masterclass was held at Apothecary 1878 on Hindley Street and the speakers for the session were James Smith, Jane Bromley and Dr Patrick Iland, all previous winners of the Vin de Champagne Award. The ten wines tasted were broken into four brackets: Chardonnay, Pinot Noir, Rosés and Rare. As always, it was really interesting to line up ten different wines and have the opportunity to compare them. Given the expense associated with Champagne, this is a very thing (for me, at least). At my end of the table, the first wine of the Pinot bracket caused plenty of discussion. It was the André Beaufort Grand Cru Ambonnay Brut 2004. It was a very savoury, spicy wine with a lot going on that perhaps you might not typically associate with Champagne. There was debate about whether or not the wine was faulty and whether or not it was best looked at as a wine first, Champagne second or vice versa. I actually really enjoyed the spiciness but certainly recognise that this is atypical and may not be everyone’s cup of tea. The Rosé bracket was also a real eye opener. Rosé Champagnes tend to be more expensive than their white counterparts and I rarely drink them. The Louis Roederer 2006 and Veuve Clicquot 2004 wines were my favourites, with more complexity than the one non vintage rosé that we tried and some very pronounced strawberries and cream type flavours. The sole downer of the night was that the manpower required to pour 10 Champagnes for 30-40 people had been grossly underestimated. The wines were very slow in coming out which really hampered the flow of presentation and discussion. This meant the event ran over time which caused a few participants logistical issues (the lady next to me had to rush off because the car park was closing! ).